Flax is the plant which linen is made from and for many years growing, Flax was a major farming occupation and industry in Ireland. This piece is hand decorated with pastel shaded flax flowers which can still be seen in the countryside growing wild in the hedgerows. The Irish Flax Lamp and Shade is a perfect addition to your home, and it would look great alongside any of the other pieces within the range. I purchased 2 of these lamps for my bedroom. They are beautiful! 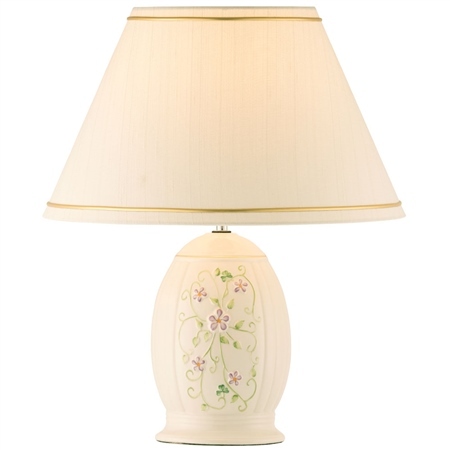 I have MANY pieces of Belleek in my home, and these lamps are among my favorites! I bought one of these lamps and bought a second as soon as I received the first one. They enhance the night stands in my bedroom. I love this lamp!! It’s so pretty!